Last April 10, 2019 Samsung Electronics Co., Ltd reveals the new Galaxy A80 – a new smartphone from the Galaxy A series that was created for the way people are engaging in the Era of Live. People are increasingly using their smartphones to share live interactions – capturing spontaneous photos, streaming live video and connecting over shared experiences that are happening right now. We are moving from the ‘era of the selfie’ to the ‘era of live’, where people are fostering more genuine and meaningful connections. Built to drive this evolution, the Galaxy A80 offers compelling innovations: a captivating, full-screen display, Samsung’s first revolutionary rotating camera and an intelligent battery. Consumers are at the center of everything we do and they search for devices personalized to their specific lifestyle. Armed with our expertise, global capabilities and rich consumer insights, Samsung is uniquely positioned to provide innovations for everyone... The Galaxy A Series provides a range of models so everyone can choose a device that fits their unique needs and enables them to pursue their passions. The Galaxy A80 offers premium features for digital natives who want to fully engage in the Era of Live. 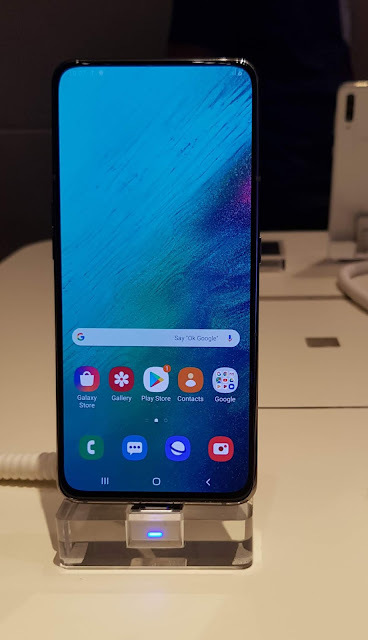 The Galaxy A80 lets people seamlessly capture the world around them with the introduction of Samsung’s first rotating camera,. The innovative camera mechanism rotates when users switch between the main camera and selfie mode to deliver the same extraordinary triple camera experience. Create pro-level Videos that has less video shake with the introduction of the Super Steady video mode. Combined with other intelligent camera features such as Scene Optimizer that can recognize and enhance up to 30 scenes, and Flaw Detection that automatically identifies glitches before you click, you’ll never miss the perfect shot. Enabled by the rotating camera, get to experience an uninhibited view with Samsung’s first New Infinity Display. Featuring the 6.7-inch FHD+ Super AMOLED screen, Galaxy A80 brings you content in vivid detail, letting you get fully immersed in every game, video, photo and story. Galaxy A80’s Dolby Atmos lets you lose yourself in the sound with a 360-degree audience experience when using earphones or Bluetooth speakers. Stay connected longer as the Samsung Galaxy A80 comes with a 3,700 mAh battery and its Super-Fast Charging at 25W capabilities. The Galaxy A80 also features an intelligent battery which learns your daily routine and app usage patterns to optimize your phone’s power consumption. The Adaptive Power Saving Mode enables users to be reassured knowing the smart battery is running most efficiently for the best performance needed. Express your style with an elegant design as the Galaxy A80 is available in two colors: Angel Gold and Phantom Black. The Gold color includes elements of pink so these colors look different depending on light direction and reflection. With its sleek design and comfortable, ergonomic grip ensures it fits comfortably in your hand – so it’s easy to use when on-the-go.